Highland Park City Hall is located at 1707 St. Johns Avenue, Highland Park, IL 60035; phone: 847-432-0800. 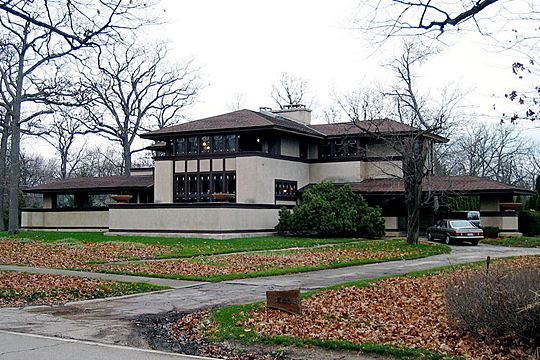 Photo: Ward W. Willits House, Highland Park, IL, designed by Frank Lloyd Wright;photograph in 2003 by user:JeremyA, (own work) [cc-by-2.5 (http://creativecommons.org/licenses/by-sa/2.5/deed.en)], via Wikimedia Commons, accessed September, 2012. Highland Park is located in northeast Illinois, on Lake Michigan, 25 miles north of downtown Chicago. With a population of 30,611 the city encompasses some 12.4 square miles and contains approximately 10,550 dwelling units. Highland Park is predominantly a suburban residential community characterized by fine examples of all significant architectural styles dating from the 1870s through today. Excellent Victorian (Gothic, Italianate, Mansard) structures stand side by side with Prairie School residences, historical revival style (Tudor, Colonial, etc.) buildings and International Style homes. Some are very large; others are quite modest. But all contribute to the rich fabric of Highland Park architecture, which illustrates not a single period of outstanding significance, but a broad overview of the development of architectural styles. The first non-Indians who traversed the area were expeditionary forces sponsored by the French Catholic Church and the French Government. Pere Marquette and Louis Joliet sought a direct water route from the Atlantic Ocean to the Gulf of Mexico in 1673. The area that was to become Highland Park went from French to British control in 1763 and was used as a resource for the fur industry; still neither of these groups settled the area. Although the Illinois Territory became part of the United States following the Revolutionary War, the Indians were not removed from the Chicago area, including Highland Park, until after the conclusion of the final Indian treaties of 1833. Then people felt it was safe to settle here. The war was not fought in the Highland Park area, but American men who fought during the Blackhawk wars saw the potential of the entire area as farmland. Many of them settled in Highland Park and encouraged others from the eastern states to settle here also. At the same time, Irish and German immigrants were arriving in the Chicago area because of easy access through the Erie Canal and the Great Lakes. Many of the Irish emigrated to work on the Illinois and Michigan Canal which was begun in 1836. Government lands were made available at a reduced rate to these workers; and some of these men purchased U.S. land grants in the Highland Park area. The Germans had also heard of the potentially rich farm lands and proceeded to set up farms. The only documented farm houses from this early period bear the names of Patrick Sheahen (1756 Sunset Road), Casper Zahnle (1520 Ridge) and Francis Stupey (north of 1707 St. Johns). Portions of the Sheahen and Zahnle cabins have been incorporated into present-day homes. The Stupey Log Cabin has been moved from its original site and has been restored. Several other farm houses such as the Hessler farm house at 82 Green Bay Road and the Sweeney farmhouse at 3543 Krenn constructed in the 1880's and 1890's (and then outside of Highland Park's city limits) currently serve as houses and have been surrounded by the growing community. Early settlers arrived by lake schooner from Chicago. The first road, known as The Green Bay Trail, was laid out by the U.S. Army between Chicago and Green Bay, Wisconsin, but it was only a horse trail and could not accommodate wagons or equipment. Besides individual farms, 1844 saw the settlement of the small community of St. Johns, which was located on a bluff overlooking Lake Michigan, just north of what is today the city limits of Highland Park. The economic growth of the surrounding area was so meager that the town never realized its potential as the shipping center its founders envisioned. In addition, road construction would not begin until the Township system was created in 1850. "St. Johns was abandoned when the town of Port Clinton was platted in 1853. Port Clinton, located in what is today the Northeast corner of Highland Park, was founded by Jacob Clinton Bloom. It succeeded as a port town because of a plank road which carried lumber and grain from towns to the west to be shipped to Chicago from Port Clinton. Port Clinton also had its own brickyard. The town died because the Chicago and Northwestern Railroad, constructed in 1854, did not use Port Clinton as a station. Also contributing, to Port Clinton's demise was the Chicago cholera epidemic of 1855 which spread to the town. Despite the demise of the town, a lighthouse which was constructed at the site of Port Clinton in 1850 continued to operate. It was one of a series to insure safe shipping along Lake Michigan, but its use was discontinued in 1860 as an economy measure during the Civil War. Today the area formerly known as Port Clinton has been claimed by the Lake. The origin of the City of Highland Park began with the construction of a train station in 1854 at what is today the intersection of Central and First Street in Highland Park. In 1853, Walter Gurnee, president of the train line and a former mayor of Chicago, formed the Port Clinton Land Corporation and bought up large tracts of land in the area from Port Clinton to the present day Central Avenue. Placing the train station at Central insured the financial success of his real estate speculation. He had bought the land, which he named Highland Park, not to farm as most purchasers of that day did, but for future resale. He envisioned the area as a place where Chicagoans would build mansions, commuting to and from Chicago by railroad. Businesses grew up around the station. These included McDonald's General Store (at the northeast corner of Central and St. Johns), the Highland Hotel (at the southwest corner of Central and First Street), and Moses Moses' Dry Goods Store (at the northwest corner of Central and First Street). McDonald's was replaced by the Erskine Bank, today the First National Bank, in 1907. A segment of an addition to the hotel still can be seen on Central at First Street, but it is to be demolished. The Moses Moses store was demolished in the 1960's. Gurnee held onto his land as it rose in value. Then, in 1867, the Highland Park Building Company was formed by a group of Chicago businessmen. This was Gurnee's opportunity to sell his holdings. The Highland Park Building Company purchased 1200 acres from Gurnee at $12 per acre. The Building Company was also buying up land south of Central to Sheridan Road. It was the intention of the Highland Park Building Company to create a gracious community of fine homes. Before construction began, Frank Hawkins, resident manager for the Company, engaged Landscape Architect William French to plat the acreage that the Building Company had purchased, from Walker Avenue to Beech Street, the north end of Ravinia, taking full advantage of the natural setting including ravines, woods, lakefront bluffs, etc. French was the brother of the famous sculptor Daniel Chester French, and was to become Director of the Chicago Art Institute. Susan S. Benjamin, architectural historian, Nancy W. Cook, architectural historian, and Leah J. Axelrod, historian, Highland Park Landmark Preservation Committee, Highland Park Multiple Resource Area, nomination document, 1981, National Park Service, National Register of Historic Places, Washington, D.C.